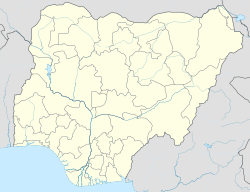 Gombe is the capital city of Gombe State, north-eastern Nigeria, with an estimated population of 261,536. The city is the headquarters of the Gombe Emirate, a traditional state that covers most of Gombe State. Recent[when?] developments include an electrical generation operation forming the basis for the Dadin Kowa water project and the opening of the new Gombe Lawanti International Airport serving Gombe State. Gombe State is mainly populated by the Fulani people, constituting more than half of the state population (more than 50%). Other minor ethnic groups include the Hausa, Bolewa, Tera, Tangale, Waja and Kanuri. The LGA has an area of 52 km² and a population of 268,000 at the 2006 census. The current Local Government Chairman is Sani H. Dogarai. Gombe is served by Sani Abacha Gombe Lawanti International Airport, and by a station on the eastern mainline of the national railway network and Gombe Line Terminal in mid-city. On Feb. 1, President Goodluck Jonathan announced that the Gombe -Kafancha-Kaduna intercity train services had been "rehabilitated", saying "the inauguration of the train services was crucial to the growth and development of the Gombe and other adjoining states." "Minister of Transport, Idris Umar ... flagged off the Gombe-Kafanchan- Port Harcourt and Gombe- Kafanchan-Kaduna intercity train services." Gombe is home to Gombe State University, Federal University Kashere, Federal College of Education (Technical) Gombe, College Of Legal And Islamic Studies Nafada, College of Education Billiri and State Polytechnic Bajoga . The modern Pantami Stadium has replaced the older Abubakar Umar Memorial Stadium, and is home to the Gombe United F.C. In 2008 an agreement was reached "to set up anti-venom manufacturing plant in Kaltungo General Hospital in Gombe," and provide medical training for snakebite patients. The Gombe State government ordered an additional N4 million in anti-venom for the hospital in 2009, due to a local increase in snakebites. The city is home to the Gombe Bulls, 2017 Runner-up of the Nigerian Premier League (basketball). Gombe has been impacted by the Boko Haram Islamist insurgency in Nigeria. On 22 December 2014, a suicide bombing at a bus station in Gombe killed over 20 people. On 1 January 2015, a suicide bomber attacked a New Year's Eve service at a Gombe church, injuring several people. On 14 January 2015, a suicide bomber killed two people and left 14 wounded at a Gombe mosque. On 2 February 2015, just minutes after a campaign rally by Nigerian President Goodluck Johnathan, an attack by a female suicide bomber left one person dead and eighteen injured. Two blasts had occurred in the city the previous day, leaving five people dead. Local residents "have set up checkpoints to defend Gombe" according to the BBC. ^ "The World Gazetteer". Archived from the original on 2007-10-01. Retrieved 2004-03-07. ^ "Gombe State". Online Nigeria Daily News. Archived from the original on 2011-10-30. Retrieved 2010-09-21. ^ "Nigeria Completes Rehabilitation of Gombe-Kafancha-Kaduna Inter-City Train". Premium Times - AllAfrica. 2015-02-01. Retrieved 2015-02-03. ^ Danjuma Williams (2015-02-02). "Transport minister flags off Gombe-P'Harcourt train service". National Mirror. Archived from the original on 2015-02-03. Retrieved 2015-02-03. ^ Aliyu M. Hamagam (2008-02-15). "Nigeria: UK, Echitab to Build Anti-Venom Plant in Gombe". Daily Trust - allAfrica.com. Retrieved 2015-02-03. ^ Segun Awofadeji (2009-09-23). "Nigeria: Gombe Orders N4 Million Anti-Snake Venom". This Day - allAfrica.com. Retrieved 2015-02-03. ^ Levinus Nwabughiogu & Susan Edeh (2014-12-23). "Bloody Monday: Bombers hit Gombe, Bauchi, kill 30". Vanguard News. Retrieved 2015-02-03. ^ "Bomb killed 27 people and around 60 were wounded in Gombe". Reuters. December 22, 2014. Retrieved December 22, 2014. ^ "Nigeria: Another bomber self-destruct outside Gombe Church". P.M. NEWS Nigeria. 2015-01-01. Retrieved 2015-02-03. ^ a b "Nigeria elections: Blast hits presidential rally in Gombe". BBC News. 2015-02-02. Retrieved 2015-02-02. ^ "Two blasts rock Nigeria's Gombe city, 5 dead: witnesses, source". AFP - Yahoo News. 2015-02-01. Retrieved 2015-02-03.